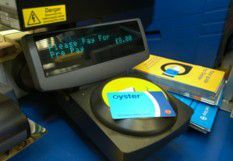 London Transport has introduced a 'Pay As You Go' Oyster card for paying for London Transport journeys on the tube and buses. Transport for London want us to use an Oyster card and to encourage us they've made the fares much cheaper compared to cash. It's estimated that £300,000 is wasted daily by paying cash for journeys. Have at look at the TFL web site to compare cash and Oyster card fares. 600,000 passengers a day are still using cash but it's never been easier to get a 'Pay As You Go' Oyster card. You don't have to register, there are no forms to fill in, and you don't need a photo. You do pay a small deposit but this can be refunded at any tube station when you've finished your stay in London. When using pay as you go you can make as many journeys as you like in a 24 hour period (from 4.30am to before 4.30am the next day) and will always be charged less than the price of an equivalent Day Travelcard or One Day Bus Pass. So, How Do I Get an Oyster Card? They are available from Tube stations, newsagents and online. TfL now offers visitors from selected countries outside the UK the option to buy an adult Oyster card before arriving in London. Visitor Oyster cards come preloaded with pay as you go travel value allowing you to jump on the tube as soon as you arrive in London. Find out more from the TFL Visitors page. As well as giving you cheaper travel, Oyster cards can be used to save money on attractions in London, including West End shows, museums, and restaurants. To check current offers see tfl.gov.uk/oyster. Read my review of using an Oyster card. Stop wasting money and use an Oyster card!